A beautiful "original" mono pressing on the ever-classic yellow and black 203 South Washington fireworks label, with it's heavy vinyl and deep groove. Original gets the quotation treatment, because unlike Blue Note LPs from this time period, with their myriad address changes, Prestige had a single label version running from 1958 to 1964, meaning that my copy could have come from the very first run off the pressing machine, but it also just as likely could have been from a later run as well. Popular titles must have been re-pressed, and there is no way Soultrane wasn't one of their better selling albums, especially once Coltrane shot to stardom on the Atlantic label a couple of years later. This lack of precise dating on Prestige pressings often keeps the prices in a much more realistic orbit than their Blue Note counterparts. Amazingly, I came across this one at my local shop, a neck busting double-take occurring as I was flipping through the racks. This couldn't possibly be an original, right? And yet, everything about it screamed out that it was the real deal. The asking price was only $65, a rare steal in this day and age, especially considering the slightly better than VG condition of the vinyl (some scuffs and surface noise in the quieter passages drops it down a bit from VG+) and it could easily go for much more. This was about as easy a no-brainer purchase for the vintage jazz vinyl collector as can be expected. The sound on these 203 South Washington fireworks labels is stellar, summing up much of what is best about late-1950s vintage jazz vinyl. Not only do these fireworks labels look great in your collection, but even in less than VG+ condition they can still show off that wide, loud and full analog sound that starts many folks off on the journey of collecting vintage pressings. 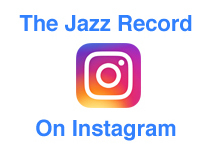 Add to that the fact that so many of these classic sessions, including Soultrane, were recorded by Rudy Van Gelder at his famous studio, and you have all the elements to make up not only a perfect jazz recording, but it's perfect representation as well. There's not a whole lot to say about the music on Soultrane that hasn't been said before, it's a stone cold classic from jazz's golden age, one of the albums where Coltrane began to overtake Sonny Rollins as the most influential tenor player in the jazz world. He would continue to build on that status throughout the sixties until his untimely death, and today in many jazz circles he's considered to be the most important saxophonist of the modern jazz era. Soultrane comes from a ridiculously prolific period of Coltrane's career, a time when he was making huge leaps as a musician. In 1957 he not only recorded Blue Train, Dakar, Coltrane, and Lush Life, but he spent time with Thelonious Monk, appearing on the classic Monk's Music. While that was a busy year, 1958 was even more productive, with Trane in the studio recording enough material for an eventual eight releases on Prestige, including Soultrane, John Coltrane & Kenny Burrell, Settin' The Pace and Bahia. If all that work wasn't keeping him busy enough, in late-1957 he began playing with Miles Davis again, recording Milestones at the start of 1958, only three days before hitting the studio to record Soultrane. Coltrane's obsession in perfecting his craft during this time is legendary, he would go home to practice into the wee hours of the morning instead of joining his fellow musicians to cavort after late-night performances. The hard work pays off on Soultrane, where Trane moves from competent sideman to leader in full, keeping the listener's interest on long takes of "Good Bait" and "I Want To Talk About You," as well as introducing a style on "Russian Lullaby' that resulted in Ira Gitler coining the phrase "Sheets of Sound" that would stick with the saxophonist for the rest of his career. The Red Garland Trio perfectly backs up Trane, these four cats recorded together quite a bit during this time and their easy rapport is a joy to behold. With all these factors at work, Soultrane is a hard bop extravaganza, truly one of the masterworks from the first part of Trane's career. Here is a fantastic video of Trane and the rest of the Miles Davis Quintet - Wynton Kelly (p), Paul Chambers (b) and Jimmy Cobb (d) - performing "On Green Dolphin Street" on a night when Miles did not perform. The performance dates from March 28th, 1960 in Düsseldorf, West Germany. This next video shows off where Trane's music would end up in just a few short years, when he teamed up with Eric Dolphy in 1961. Here they are performing the classic "Impressions," most likely during the European tour that followed their famous engagement at the Village Vanguard. The rest of the group is McCoy Tyner (p), Reggie Workman (b) and Elvin Jones (d). Historical stuff.